Cholera is a contagious acute disease characterized by lesions of the small intestine, a violation of water-salt metabolism, varying degrees of dehydration because of fluid loss with watery feces and vomit. Refers to the number of quarantine infections. 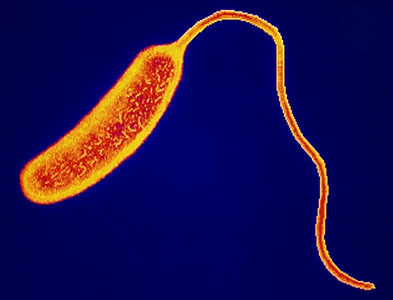 Pathogen is called Vibrio cholerae existing in the form of curved rods which dies after boiling for 1 minute. Some biotypes long persist and multiply in iodine, in the mud and among the inhabitants of water organisms. The source of infection is a person both the patient and the carrier. Vibrios are excreted either with feces or vomit. Epidemics of cholera are known being caused by water, food and mixed with susceptibility to cholera is being rather high. Cholera is periodically extended to many countries and whole continents, claimed millions of lives and the last pandemic disease began in 1961. So far the epidemiological situation of cholera in the world remain tense and annually infects up to several thousand people. In South and South-East Asia and some countries in Africa with the African continent recorded more than half of cases. There are endemic foci of cholera epidemics occur periodically. Symptoms are very diverse starting from an asymptomatic carrier state to severe dehydration states with sharp and lethal. When treating patients with cholera is very important to care for the sick. In the ward for patients must be maintained impeccable cleanliness, the strict disinfection regime. It should eliminate all impacts which can irritate patients and adversely affect their nervous system. Those need special care for the skin and mucous membranes of the mouth as well as eyes, urinary and sexual organs. The wards must be maintained sufficiently high temperature. Treatment of patients with cholera should necessarily be in the specialized infectious hospitals. The sooner treatment is started, the better results and fewer opportunities for the development of complications. The first treatment is aimed at compensation for the loss of fluid and salts, the correction of metabolic disturbances and suppression of vital activity of the vibrios. Number of injected liquid should be about 10% of the patient’s body weight. The solutions injected heated to 38 – 40 CÂ°. The introduction of the first 2 – 4 liters is a drip rate of 5 – 10 ml / min. Then produce a more accurate calculation of solution, which depends on fluid loss from the vomit and feces. In mild form of disease with dehydration I – II degree held oral rehydration, for this purpose using a glucose-salt mixture “Oral”. If necessary, oral rehydration can be carried out through the probe. Emerging sometimes vomiting is not a contraindication for rehydration. In addition to rehydration therapy, antibiotics required. The most frequently used tetracycline in doses of 0,3 – 0, 5 grams 4 times a day for 5 days. You can apply chloramphenicol in a quantity of 0,5 g every 6 hours for 5 days. Vibriocarrier takes 5-day course of antibiotics. During the period of cessation of vomiting, the patient is allowed to eat slimy soups, porridge, yogurt, the butter, vitamins, as a rule, special power of cholera patients is not required.